We offer hotels, catered and self catered ski chalets in Val Thorens, Meribel and Courchevel in the 3 Valleys, as well as elsewhere in the Savoie Region and Verbier Switzerland. Within catered chalets there is a range of choices: The most deluxe chalets offer all en-suite bedrooms, champagne reception on arrival, jacuzzis or saunas or both, professional chefs with staff living in, and beautifully prepared four-course dinners with a selection of the finest wines. 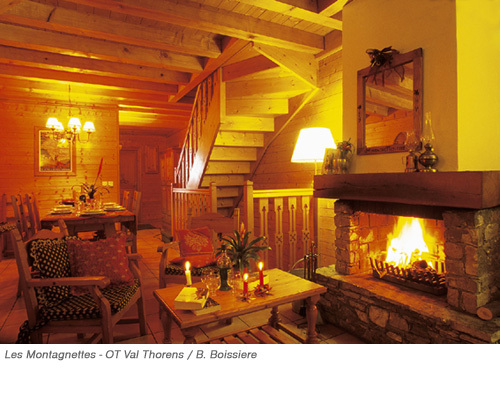 There are also many simpler, comfortable and congenial chalets, not as luxurious and considerably less expensive. They have experienced staff, many have fireplaces, and evening meals are a three-course dinner with unlimited wine. Catered chalets can be rented by a group that would occupy the entire chalet, or they can be rented to individuals or couples who then become part of a compiled group. A great way to dine with and meet new friends. 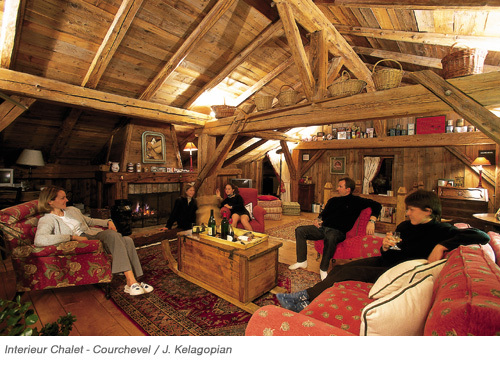 Self-catered chalets are apartments built in charming connecting chalet style buldings with fireplaces offering comfortable accommodations in a rustic Alpine style for groups of 6 to 14 people traveling together. 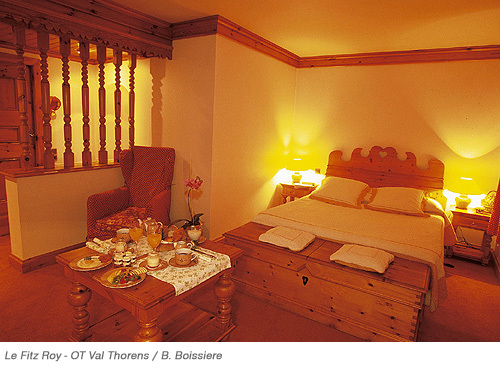 They are fully equiped for self-catering, and are often either ski-in, ski-out or are located across the street from the slope or the ski lifts. They offer the best value for the money. They also typically have en-suite bedrooms. 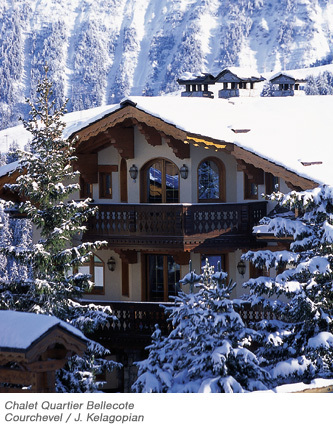 There are a number of very beautifully appointed self-catering chalet appartments, notably in Courchevel. They have very luxurious interiors; one comes with an indoor swimming pool. 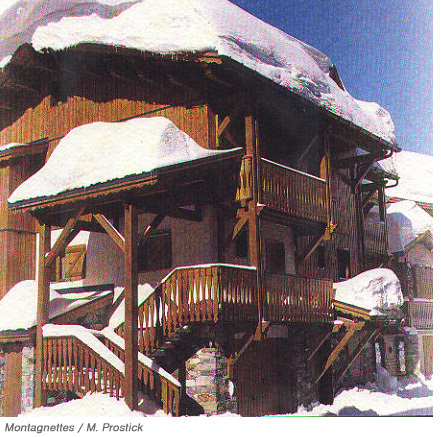 These chalet apartments are of top quality and price. If you give us your specific requirements for the type of lodging you require, we will fit you into the most suitable accommodations. 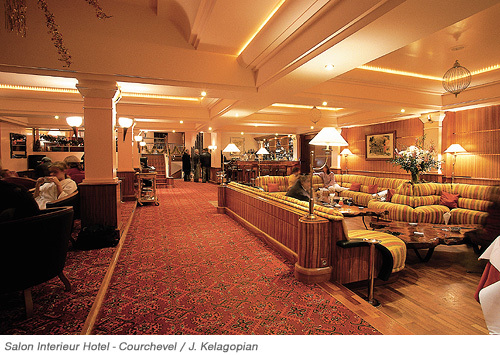 Savoie Ski Tours offers a wide range of hotels, from the near luxurious, to the very luxurious, with large spacious rooms and suites with spectacular views, indoor swimming pools, whirlpools, saunas, steam rooms, and fitness rooms. Rates are typically per person per night and usually include breakfast and dinner, but you can get all three meals or just breakfast. Many hotels are family run, and the French consider you a guest in their home, so that it is not hard to find a reasonably priced hotel that will provide you with a gourmet dinner.